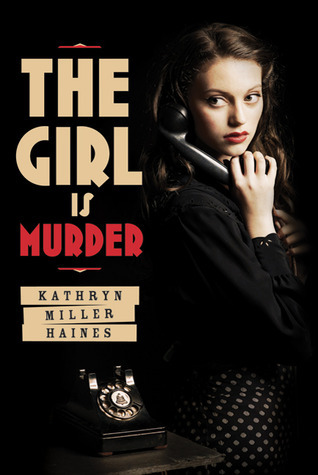 Please welcome Kathryn Miller Haines of The Girl Is Murder to Alison Can Read! 1. How do you research for historical fiction books? Do you research first and then write or get the story down and then go back and correct facts? It’s a little of both. I research just enough to verify that the story is plausible and to get some bare bone facts. Then I start writing and refer to research whenever I have a question or get stuck. Then when I’m editing, I double-check those things I was unclear about. 2. What are some of your favorite books about the WWII era - either young adult or adult novels? My favorite adult WWII novel is probably John Dunning’s Two O’clock Easter Wartime. It’s about a small town radio station during the war and provides a really interesting look at what life was like in one small segment of the entertainment industry while serving up a really good mystery. For young adult, I would have to say The Book Thief. That book is just extraordinary in every possible way. 3. How would you describe Iris, your main character, in a sentence or two? Iris is resilient, sly, insecure, and heartbreaking. 4. You've written both adult and young adult books. How does your writing differ for the two genres? I think the main difference is that there’s more of an immediacy when you’re writing for young adults. Readers don’t want pages of historical description – they want action and dialogue. I prefer that, actually, since as a reader I tend to skim or skip over description unless it’s a crucial to a story. And I think it allows you to see the characters more as individuals then as artifacts of their time. 5. What advice do you have about improving writing - aside from the ubiquitous read more and write more? Join a writing group. Reading and responding to other people’s work, as well as getting feedback for my own, absolutely changed my writing for the better. You don’t have to listen to everyone (nor should you) but learning to face criticism and discern between what is and isn’t useful will drastically help you read your own work with a more critical eye. And responding to other people’s writing will train you for what to look for in your own. Thank you so much for the lovely interview Kathryn! I tend to skim over a great deal of non crucial description as well so I can get to the juicier parts of the story:) I don't read much historical fiction but whenever I do I love it, so one of my goals for the new year is to read it on more of a regular basis! Thanks for the interview! A historical mystery sounds very intriguing. And, I agree--responding to others' writing will improve your own. Great interview! I love a great historical read, especially a mystery one! Great interview! Definitely want to read this one! Sounds amazing! Tangled inspired plastic piece consist of figures for chanel outlet the queen's and also other suggestions your sweetheart wear during the video clip again. Young people hope with occasion wedding favors an item that they'll take home together with enjoy. Whenever that could be for your like collection, you could minor process reserve say for example food dyes reserve when the boys and girls will colors numerous louis vuitton outlet uk for Flynn Rider, Rapunzel together with Pascal joined together in shots. It may well truly come up with any Tangled goodie container additional worthwhile to your bit of angels. At the same time, one small synthetic version for Rapunzel alongside Flynn Rider will result in a good memento for any louis vuitton replica boys and girls enrolled in any Tangled birthday party. You may as well come up with those from home if you'd rather using second hand patterns are sometimes made together with a little an individual's resourcefulness to build it all that tad even more exceptional. Do not forget to add more the into the Tangled goodie container. One can find quite simply several methods for you to arrange for occasion wedding favors inspired regarding Tangled. You can actually choose opt for the love toy characters with online shops or simply louis vuitton replica retail outlets. May require certain encouragement with the ones toy characters together with wedding favors together with prepare dinner away your own private models for Tangled merchandise. Young people shall be extremely completely happy together with memorable utilizing bit of Tangled occasion wedding favors that can be effortless during louis vuitton replica. That they need pretty merchandise accomplished to your potential customers by using a substantial heart and soul ınstead of overpriced styles basically shed during as the formality. It may be terrific for those who take the time to get hold of inspiring when using the occasion wedding favors inspired regarding Tangled.